Howlin' Wolf Records: SIX STRINGS: La-La Land Records... Doubles Your Score! La-La Land Records, 20th Century Fox and Sony Music present the remastered and expanded 2-CD release of renowned composer Michael Kamen's (DIE HARD, LETHAL WEAPON, MR. HOLLAND'S OPUS, THE IRON GIANT) full-throttle orchestral score to the 1995 Twentieth Century Fox blockbuster DIE HARD WITH A VENGEANCE, starring Bruce Willis, Samuel L. Jackson and Jeremy Irons, directed by John McTiernan. 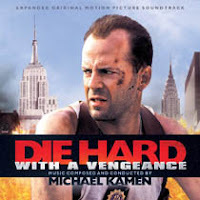 Long overdue, Michael Kamen's final, sensational DIE HARD score comes roaring back to life in an explosive deluxe version that runs over 2 full hours, greatly expanding its original 1995 soundtrack release with a new presentation worthy of the composer's masterful work. Kamen's score is presented here as initially composed for the film, giving listeners a chance to hear material that was ultimately not used in the final version of the movie. Produced by Nick Redman and Mike Matessino, produced for Sony Music by Didier C. Deutsch, and mastered by Mike Matessino, this special release is limited to 4000 units and features plentiful bonus tracks as well as exclusive, in depth liner notes by film music writer Jeff Bond. Also included is the classic rocker that kicks off the film, "Summer in the City" by The Lovin' Spoonful. As only John McClane and any film music fan would say...Yippee Ki Yay...! 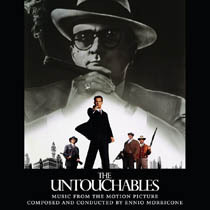 La-La Land Records, Paramount Pictures and Universal Music Special Markets present the remastered and expanded 2-CD release of acclaimed composer Ennio Morricone's (THE MAN WITH NO NAME TRILOGY, THE MISSION, FAT MAN AND LITTLE BOY, IN THE LINE OF FIRE) masterful orchestral score to the 1987 Paramount Pictures crime classic THE UNTOUCHABLES, starring Kevin Costner, Sean Connery, Andy Garcia and Robert DeNiro, and directed by Brian De Palma. This superb sounding release marks the 25th anniversary of this beloved film and its indelible, powerhouse score. Disc One contains the score mix as heard in the film while Disc Two features the remastered, Grammy-winning original A&M soundtrack (which was mixed differently), along with special bonus tracks that include a song demo "Love Theme From The Untouchables" performed by Randy Edelman! Produced by Dan Goldwasser and Neil S. Bulk and mastered by Doug Schwartz, this special release, limited to 3500 units, features exclusive in-depth liner notes by film music writer Jeff Bond. 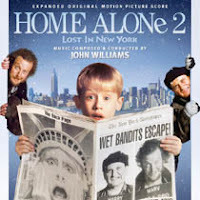 This is the ultimate release of a film music classic. Here endeth the lesson! Available Now... and is a LIMITED RELEASE! 5/5... 5/5... 5/5... Maybe you have heard of these? Can you read that right, these are some of the more popular films in the last 25 years that have had score releases, but left the masses wanting more. Well those screams have been answered by "La-La Land Records" bringing us Morricone, Williams and the late Kamen... favorites yes! Masterpieces! We just watched Die Hard with a Vengeance last week!